There are many great benefits to reading a big chunk of the Bible all in one go. We see many themes better when viewing a story from a distance, and see how the characters and plot of one story fit into The Big Story of the Bible. It helps us not to take one verse out of context, and to compare it to others about similar things. 1 Decide how you’re going to divide up the story. I think it’s easier, even for really large stories like the Exodus or the Easter stories, to choose a small number of parts, especially for younger children. For the rest of us, having maybe 4 or 6 scenes to create helps us to process the story – What’s important? What’s essential? What’s significant to me? Where might I be in the story? These questions don’t have right and wrong answers, so they give us scope to discuss as a family, discovering more of God in each other as we do so. You might want to make a storyboard each o after this, but don’t miss out on the opportunity to chat these things over together, as it’s here that we share in each other’s faith journey. If you are doing a big story and have lots of time, you could do one part for each chapter. We did this when doing our Esther books, but it did take a few hours. 2 Decide how you’re going to storyboard. You might like to go for words or pictures describing the plot, characters, location and action. You might focus on the words which are spoken, or follow one person or object through the story. You might want to go for symbols of the meaning of each part of the story. It’s up to you, however you best express yourself. If you’re planning to use the storyboard to help you re-tell the story, as we do with our Exodus story at our Passover meal, you might want to bear that in mind and think about your audience when deciding how to represent the story. 3 Decide what medium you’re going to work in. 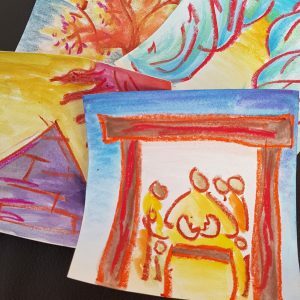 I’m currently loving crayon resist water colour pictures, where I draw a basic picture using one or two colours of crayon, then paint over it with s strong a watercolour wash as the crayon will ‘push’ through. You might like to draw or paint, to chalk or use loose parts like stones, shells, buttons and lollysticks. Maybe you’d prefer to create something more three dimensional with pipe cleaners or lego, Duplo or Play Mobil, wooden blocks, junk modelling or Mechano. You could make pictures, take photographs or even make a video. Our children have recently enjoyed making simple stop animation videos using the StikBot app (other apps are also available). Once you’ve decide, get going! 4 Decide how you’re going to share it. I think one of the ways to solidify or consolidate learning, be it educational or spiritual, is to share it with someone else. See if you can find a way to share your storyboard with someone – maybe telling it in a group, or sending pictures or a video to friends or family via WhatsApp. It’s also a brilliant way to inspire others, for them to see what God’s doing with you and to be encouraged that they too can explore the Bible at home in fun and meaningful ways.